Ebook $6.99 Download Ebook instantly! Konstantinos “Gus” Deligiannidis, BA, MBA came across the seeds of his book several decades ago, while going to college in Greece, working for his bachelor’s degree. Back in those years there was no internet, no cell phones, no drugs, and no jails filled with drug addicts. Back in those years in the beautiful city of Athens Greece, people were getting together many times for good fellowship and entertainment and would talk about different topics of interest. It was in one of those get togethers that Ted, an animal husbandry major at the University in Athens, Greece said: “You can become immune to many diseases when you eat dairy products. At that time probably there was not much talk about that mineral and the lack of it in our body that causes over 140 diseases: CALCIUM!!!! And that statement – about Calcium – stayed at Gus’ subconscious all his life. In 2001 it became apparent that Gus needed a very high level of supplementation of this mineral, either through food or supplements. Gus continued to educate himself about minerals and vitamins. 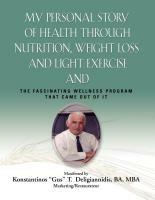 He went on to an easy to follow diet based on the Greek Mediterranean diet. Calcium, Vitamin C, Vitamin C with Bioflavonoids, Magnesium, Phosphorus, Potassium, etc, etc that helped him tremendously in his quest for better health, basically without medication. The results were spectacular!!! Out of all the minerals and vitamins, we need to stress Vitamin C with Bioflavonoids. Even a doctor’s wife at a recent live Interactive seminar that Gus put up, did not know what this fabulous vitamin does when it contains Bioflavonoids. It revitalizes the absorption part of our innate intelligence function so that we absorb the minerals and vitamins from the foods we eat or the supplements we take. And then by expressing good faith, he went on and tried to see how he could get some help from exercise. Nobody has one or two hours to exercise. So he did whatever he could. Ten, Twenty or Thirty minutes of light exercise every day. Again, the results were magnificent. Exercise, along with simple and a meaningful diet (no guru diets) and lots of water, helped him loose over 55 pounds, and kept it of till today!! That is why he proved his mother wrong, because she said “Even when you were a little guy, you had a belly”!! After all these simple things that he did, he got his anxiety and depression symptoms to the lowest level without the need of medication. Because of anxiety disorder medication, was the cause for a teenage girl to develop blocked arteries in the area that he has lived in for the past three decades. Gus Deligiannidis MBA unveils a new health concept to inspire and change lives. Gus has shaped his mind and made him the inspiration he is today. Gus had studied how food, vitamins, and activity affect your health. Gus’ manifestation of healthy eating and exercise can and will change your life.